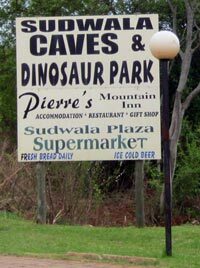 The Sudwala Caves, located in Mpumalanga, South Africa, are set in Precambrian dolomite rock, which was first laid down about 3,800 million years ago, when Africa was still part of Gondwana. The Sudwala Caves themselves formed about 240 million years ago, making them the oldest caves in the world. The Sudwala Caves were predominantly used for shelter in prehistoric times, probably due to the constant supply of fresh air from an unknown source in the Caves. Where did the name "Sudwala" originate from? In more modern times, the caves were discovered by Somquba, one of the sons of the Swazi king Sobhuza I, who was fleeing from his brother Mswati II at the time. Somquba and his followers used the caves as refuge, until Somquba was killed in an unexpected attack. Survivors stayed on under the leadership of an inDuna (headman or leader) named Sudwala. During the Second Boer War in 1900, the Sudwala Caves were used by the Boers to store ammunition for their 94-pounder Long Tom guns. It was thought that the caves may have been used by President Paul Kruger to store the legendary "Kruger Millions", a gold bullion which reputedly disappeared somewhere between Waterval Onder and Nelspuit during Paul Kruger's flight from Pretoria to Lourenço Marques (now Maputo). The major chamber in the Sudwala Caves is the PR Owen Hall, it is 70 meters in diameter and 37 meters high, with a constant temperature of 17°C. This chamber has been used a concert hall no a number of occasions, due the almost perfect acoustics that can be found inside. Apart from the PR Owen Hall, other popular attractions are the "Devil's Workshop", the "Map of Africa" on the cave's ceiling, and the magical alcove dubbed "Fairyland". One of my favorite things to do in South Africa is to visit the caves. South Africa's caves are very special, and a visit to the Sudwala Caves is no exception. A visit to the caves starts with a long road winding up the mountain to the parking area, where visitors can safely park their cars under the watchful eye of the security guard. We opted for the standard tour, as our timing where a bit out, and we were not in time for the Crystal tour. But, I will definitely make sure that our timing is better, and go for the extended Crystal tour on our next visit! Our tour guide was very knowledgeable about the caves, and entertained and informed us with interesting little tidbits about the caves history. We passed a collection of tools used by the early humans using the cave as shelter. As we moved further into the caves, the temperature difference became quite apparent. A stream of fresh, cool air from an unknown source permeates the spacious corridors in the Sudwala Caves system, maintaining the temperate at an even 17°C all year round. But don't be wary of getting cold! The humidity in the caves are fairly high. As we continued our tour, we marvelled at the natural rock formations and the realization that we are walking into a bit of the history of the earth. It takes hundreds and thousands of years for some of the formations to form. The natural beauty in the cave is breathtaking. Keep an eye out for the odd little green plant growing by the electric lights. It looks like these frail little plants searched specifically for the light and heat generated by the electric lights. Nature will truly find a way to prevail in even the harshest conditions. A trip to the Sudwala Caves is a definite must-do for travellers to the Mpumalanga region. The beauty of the caves and surrounding mountain and valleys are something truly to behold.